If you use a shower with tiles, you've inevitably struggled with keeping the grout lines clean of mold and mildew. Every article gives you tips on how to reduce the mold and mildew by reducing humidity in the bathroom after showers and to squeegee as much water down as possible. But realistically, that's a lot of work for what is generally a hectic morning. So how does this natural and safe method work? Baking soda in itself is slightly abrasive, so it's naturally great as a cleaning product. When baking soda and vinegar mix, it creates an acid-base reaction that helps with the cleaning process. Hydrogen peroxide is a disinfectant good for getting rid of germs, toxins, and bacteria. My take on the natural way is that it takes A LOT of time and scrubbing. Mixing the ingredients takes only a few minutes, but you have to left in product sit while it works for 5-10 minutes before you start scrubbing. Depending on how severe, you may have to repeat the process. It took so long that I ended up purchasing a spin brush attachment for my power drill. And yes, it does eventually at least 30 minutes of scrubbing on my hands and knees, I manged to get rid of the mildew in a small section. Unfortunately, the mold stuck around as white specs in the grout. The worst part is the smell... just a natural vinegar smell. Just the one product that can be purchased almost anywhere. And it comes in a spray bottle! The caveat to this it should only be used on non-porous tiles. So if you have marble or granite tiles, you'll risk discoloring your nice stone. 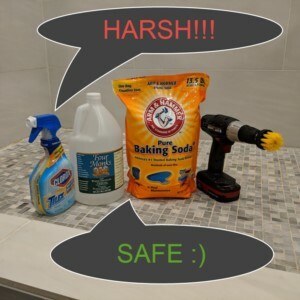 My take on this harsh way with a Clorox product is that it makes cleaning much easier! Spray for 5 minutes. The mildew and mold should disappear. Then just rinse away the product and the cleaning is done. The downside is the smell. It's absolutely harsh. I'd recommend opening all the windows and fans and close as many doors as possible. Spray, leave the room for 5-10 minutes. Rinse with water. Then leave the room again until all the smell disappears. After giving the safe and natural grout cleaning method a try on 4 or 5 different occasions with mixed results, the best being with the spin brush, each of those results had only been in small patches. That's when I figured I'd give Tilex a try and managed to clean the entire shower in 10 minutes. With Tilex, I use gloves, keep my time in the sprayed areas limited, and I'm done cleaning all three bathrooms in 30 minutes or less. Cleaning naturally just takes too much time and effort. Plus, having to scrub the grout ends up putting lots of strain on my body and knees. All in all, considering I have multiple showers with grout to clean, I'm likely to opt for the Tilex from the perspective of saving time.